Ryan Gosling is Stephen Myers, an idealistic and confident young man who is the brilliant media consultant for Mike Morris (George Clooney), a rising political star who, with the right campaign management and carefully executed strategy, will secure his party’s nomination for president of the U.S. Morris is handsome, intelligent, passionate, successful, sincere, and determined. His fiercely loyal campaign manager, Paul Zara (Phillip Seymour Hoffman), is a veteran of hard-fought political campaigns and brings a lifetime of experience to the job of getting his guy elected. Before the race for president can even begin, though, Morris must defeat the party’s other top candidate who has his own capable and experienced campaign manager in Tom Duffy (Paul Giamatti). Winning the Ohio primary is the next crucial step. The young Myers, while certainly not a wide-eyed innocent, is completely convinced that Morris is the answer to all that plagues the country and will successfully bring about a new era of equality, prosperity, and peace when he is elected. A member of the campaign’s inner circle, his faith in Morris is as unshakeable as his confidence in his own talents to craft an irresistible message that will ultimately put him in the White House. Well-liked by everyone working for Morris, Myers has the talent and savvy to be Zara’s protégé. When Tom Duffy calls Myers one day out of the blue and requests a private conversation with him, Myers’ instincts tell him not to do it, but circumstances convince him that he should find out what Duffy wants. Myer’s decision to meet with the campaign manager of his own candidate’s nemesis will have tragic consequences that no one could have foreseen. Navigating the treacherous world of back-room deals and compromised principles, Myers soon finds himself in over his head and way beyond disillusioned. What will he do with his new-found knowledge of the seamier side of political campaigns? I left the theater feeling intensely relieved and happy that I don’t have any personal connections with politicians. 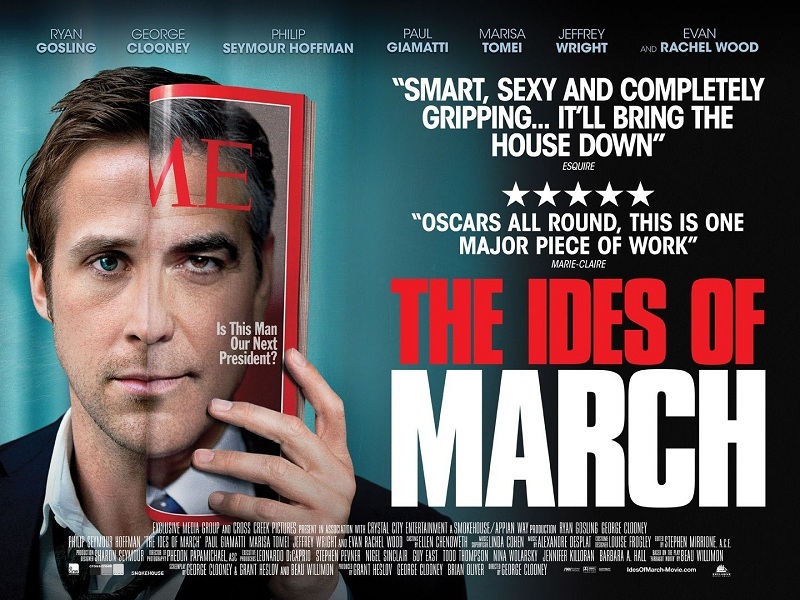 The Ides of March is a smart drama that puts its all-star cast to good use. Clooney’s taut direction drives the story forward at a nice pace that never drags or bogs down in exposition. Ryan Gosling depicts the ambitious up-and-comer effortlessly, being at turns a victim and then manipulator of circumstances, whose crash-course in dirty politics all but derails the entire campaign. Ambition Seduces. Power Corrupts. Knowledge is Power. In the end, just what will he do with the knowledge he has gained? What will it take to erase the stench of dirty politics? This entry was posted in Movies and tagged campaign, drama, Evan Rachel Wood, George Clooney, Ides of March, Jeffrey Wright, Marisa Tomei, Paul Giamatti, Philip Seymour Hoffman, politics, Ryan Gosling by S.D. McPhail. Bookmark the permalink. Thanks! You are right about a certain lack of suspense but I felt that the intelligent script and great performances are what this movie is all about. Gosling was riveting, wasn’t he?